"A very attractive and collectable Wilkinson Ltd. Art Deco shape 120 lustre ware vase - a stylish interior designer's example of the great Staffordshire Art Deco period pottery tradition. Wilkinson are best known as the Clarice Cliff people and made pottery to be decorated with Clarice Cliff patterns. This Japan influenced Kioto pattern vase is art deco with a classic minimalist shape and contemporary styling. The deco-lotus design is enhanced by the oily, iridescent, powdered metallic blue and black background finish. 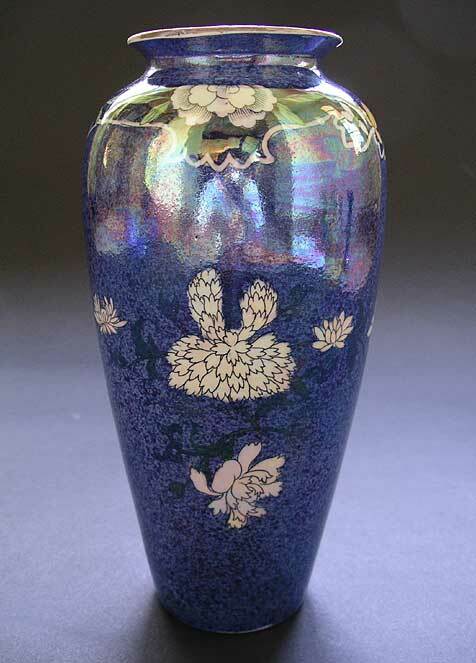 A real gem of a vase for the right decorative corner!" Antiques Expert Hamilton Bear. References: Impressed Wilkinson shape number 120 to base indicates production from c.1924 onwards. This shape, although not designed by Clarice, was used by Clarice Cliff when the Original Bizarre Ware design range was introduced. A shape 120 vase is illustrated in the first (1928) advertising material in Griffin and Meisel, Clarice Cliff The Bizarre Affair, pp. 20 left. 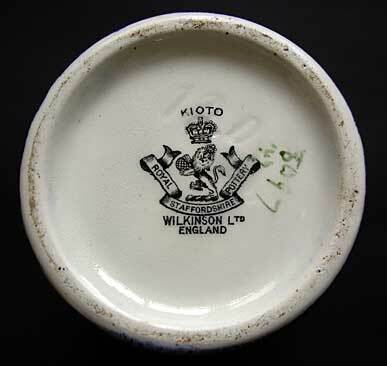 Marks: "Wilkinson England", " Royal Staffordshire Pottery". printed; further impressed and hand painted marks, as illustrated. Condition: In excellent general display condition with no significant wear to lustre decoration and no restoration. Condition report: There is one small chip from the rim of the vase which could be restored if required; a thin brown-gold line around rim is mostly rubbed away. Inside the vase a tight surface hairline runs two thirds of the length from the base. 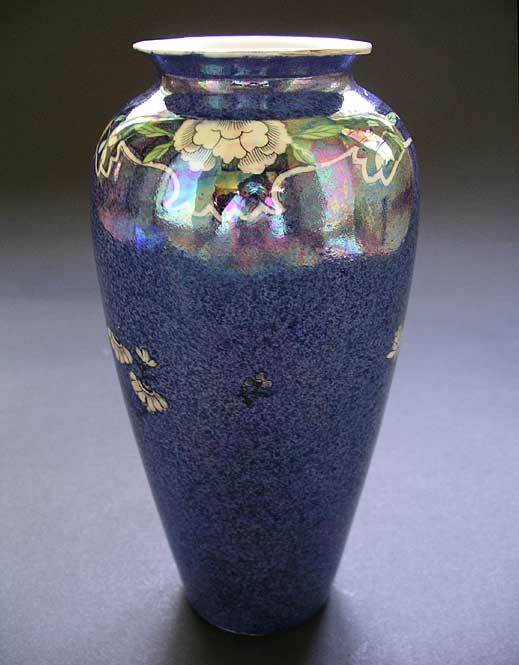 This does not extend through to the outside and cannot be seen, or felt, on the decorative outside surface of the vase. 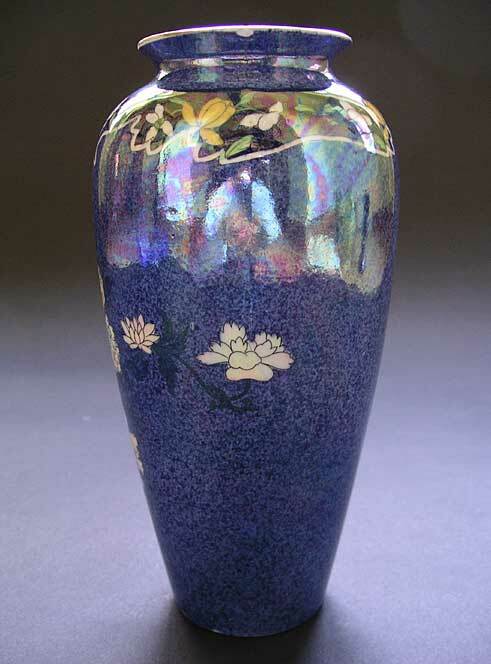 Generally a good display example of a rare vase which has remained in use until very recently. M.O./CHECKS US $ DOLLARS NO UK BANK FEES OR EXCHANGE CHARGES. PERSONAL CHECKS IN GBP ONLY - MUST CLEAR BEFORE SHIPPING.